Over the past few months I’ve dedicated approximately 24 hours in total to the Adobe Responsible Disclosure program. I am currently the leader of this bounty program by a significant margin, this is however mostly attributed to the fact that the program offers no cash incentive for bounty hunters. I was informed that they do however run private bounty programs on occasion for cash rewards. I set myself a personal goal of submitting 100 bugs and then planned to do a public disclosure of all the issues I discovered. This was primarily meant as a means of advertising the security consulting services I provide as a freelancer. This plan however went a bit sour, as Adobe requested I keep the details of the issues I responsibly disclosed private, which I feel they are fully entitled to do, so what I have decided to do instead is this blog post. This will outline from a high-level the kind of issues I’ve been finding on their web services. 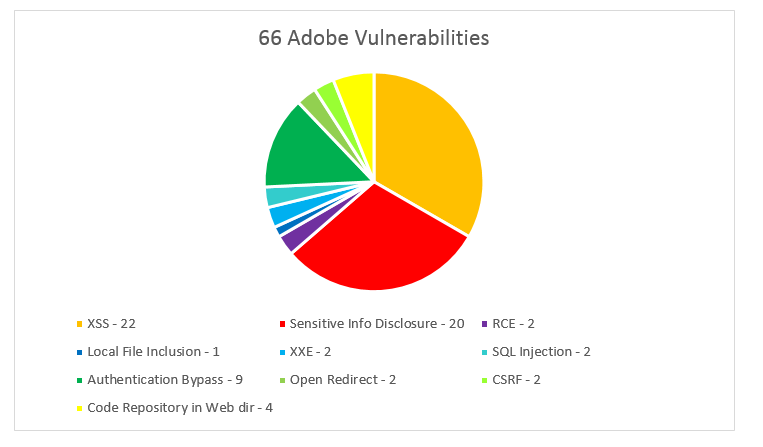 This data is based on the first 66 vulnerabilities I submitted. As you can see in the pie chart below, 33% of all the bugs I submitted were Cross Site Scripting (XSS) vulnerabilities. It’s easy to understand that XSS is still very widespread and will remain a common web security problem in the OWASP top 10 for a long time. Another 30% of the issues I found were “Sensitive Information Disclosure”, these varied widely and included such things as finding web logs in the web directory, configuration files, misconfigurations that allowed source code to be downloaded and even a public-private key pair in a web directory. Some of the most severe issues I identified were authentication bypasses or privilege escalation bugs. These allowed administrative access to various content management systems belonging to some of Adobe’s key services. A lot of these were achieved by accessing administrative panels directly that had broken authentication, through finding hidden registration forms or simply misconfigured permissions. These accounted for 14% of the findings. 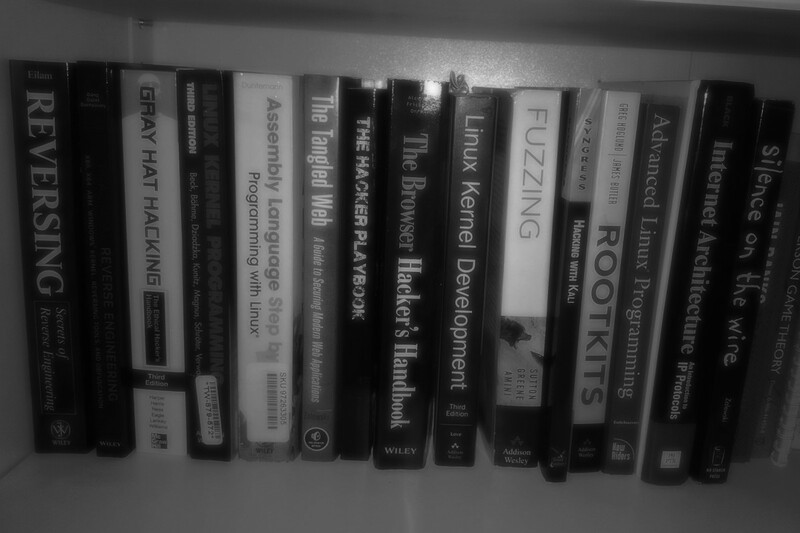 I discovered quite a lot of other critical issues that could or do allow the leaking of a lot of sensitive data. Remote code execution, SQL Injection, Local File inclusion and XXE are the kind of vulnerabilities that would generally reward handsomely on a paid bounty program as issues like this could cost a company millions if the information was in the wrong hands. I also found multiple code repositories available in web directories. These critical issues accounted for 15% of the 66 bugs I reported. There are definitely some interesting contrasts to be drawn between the security of some of the paid bounty programs and that of Adobe. There seems to be a lot more obvious and “low-hanging” issues throughout the Adobe web services. This could mean Adobe have a lower threshold of difficulty so is a perfect target for some new bounty hunters. This gives me hope, as it’s becoming clearer that the bug bounty community knows the value inherent in what we do. Companies should be forced to realise that even a small cash incentive can go a long way in convincing the community to look a little deeper at your bug bounty program. Even at $20 a vulnerability, the 66 issues I submitted would pay my months’ rent. Regardless of what way you look at it, its a billion dollar organisation being cheap. Once I hit my 100 bug goal I won’t be looking at their stuff any further without a cash incentive. I am undercutting the bounty communities “No Free Bugs” motto simply as a means of trying to get myself a bit more contract work and for that I am sorry. I see bug bounties as something the world needs right now. They provide a great means for young infosec students to break into the industry and get a few notches of experience on their CV, all while earning a bit of pocket money for the effort. Many people like myself are seeing bounties as a means of making consistent income so they can work for themselves or even fill in the spaces between contract work as a freelancer. Bug bounties present an excellent opportunity for beginners to practice their practical skills on real systems, this is much more valuable as “industry experience” than that of Capture the Flag events you may get in universities for example; you are getting real experience in reporting the issues found. Bug bounties are extremely valuable to the companies leveraging them too, they give incentive for a defensive security team to be pro-active about defending the companies systems. I imagine they have revolutionised the way the internal incident handling is performed or at least improved or greatly reduced the turn-around time for resolving security issues as the programs become more mature.